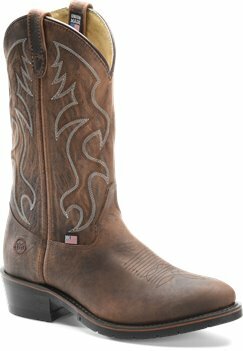 Designed for the cowboy who requires a narrow B width or the cowboy who requires a wide EEE width, this boot will make you look good even during the harshest conditions. Been wearing double h boots for years. Most comfortable, stylish, lasting work boots I've found. Working on my feet in the oil industry all day it is hard to find a comfortable boot that last but these boots average 14 months for me when most others average 6 months. Shoeline makes ordering and receiving a breeze, with great prices... if only they'd have coupons for this particular boot sometimes. boot was tight. Had no problems with returns. These boots are the best they make. It was also great to get 30% off too. Shoeline is the best. Easy returns and free shipping. Cant go wrong here. I will be buying all the boots through here. I've been wearing nothing but double h work boots since the first pair I bought in 2003. They are the most comfortable boots ever; steel toe and non steel toe. I've bought both. I must be honest though. I wish the soles had a better "lug pattern" on the style I purchased. Other than that, they are perfect. These are my work boots of choice, comfortable worn every day on the job site. Shoeline quickly shipped my order and they arrived within a few days. I will be recommending Shoeline to friends. This is a really well made boot that comes in a narrow size. My husband wears these to work everyday. I have looked for YEARS to find a boot that would fit. This boot not only fits, but is so comfortable right out of the box! IT is amazing! I would definitely recommend this boot! 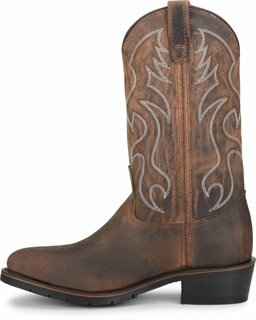 My husband has been wearing this same boot style for truck driving for about 15 years. We both love HH boots and the oil resistant sole really a big plus for him. He has a very wide foot and this boot always feels just right for him. These are my favorite boots to wear, I wear them everyday. Great fitting boots very supporting and comfortable. I bought 2 sets of boots this time. I have been pensive because the last pair of 2282's that I purchased real had a problem which I ignored until I had worn them past warranty. I won't do that again, but I did wear these boots for several days on my carpeted floor and have put them both into rotation. So far so good. Just want to make sure that you understand I would not buy them if they weren't make in the USA and they didn't last (even the ones that hurt my feet, out lasted pretty much everything else, to the detriment of my feet), again so far so good. It is a sharp looking and comfortable boot. I really like them! My husband has worn these boots for several years now. This was the best buy I had ever seen. Use a coupon code and it was a good deal. Been wearing Double H boots for years and love them. Like the fitstyle and the fact that there still made in the U.S.A. Great boot and customer service. Great work boots. Price was amazingly low compared to others. Fit and style are great. Very quick delivery. Accidently bought steel toe. instead of having st on description have the hole thing written out. kept boots cause the toe doesnt bother me much. just dont like having holes in toe of boot after working in them. my mistake. very good seller though. will do business again. Good service-was able to track delivery thru your emails pretty cool. Boots are perfect-be sure to tell HH Brown not to stop making the BEST most comfortable steel toe western boots there are. This is my 3rd pair and they really do last a long time- superior quality I wear out the insides before the outsides-never had a pair resoled just the heels. Thanks and keep up the good work. I have been wearing double H boots for more years than I can remember. the boots I got 6 months ago had guality problems. My experience with this product was positive throughout the entire transaction. Excellent web site easy to navagate and pretty good turn around on the shipping. Great boot fits just like any other HH I have. Great service easy to purchase. Good looking and sturdy boot and best of all it’’s made in the USA. Received it in a short time frame too. Love the looks but the right steel toe is rubbing on the joint of my middle toe. It has become sore trying bandaids but not working too well. This is my second pair of these boots and they are the most comfortable pairs of boots I own. It’’s amazing that a pair of steel toed boots feel better than your dress boots. Great looking work/riding boot Had to exchange the original for a half smaller size to get a good fit however. Thanks for the UPS return shipping label and the prompt exchange. I like the No Hassel courteous service.